234Bet Sign up offer 2019 | Get up to N 500.000! Register at 234Bet and receive up to N500.000! This online sports betting operator has recently started to operate in Nigeria. It has prepared a nice welcome offer for all the customers who are opening their account for the very first time. This bonus could reward your first 4 deposits for a total amount of N500.000! For more details continue to read our article. You have to be over the age of 18 in order to qualify for this promotion. You have to be a legal resident of Nigeria. This offer can’t be used in conjunction with any other 234Bet promotional offer. This welcome bonus is entitled once per person. Wagering requirements apply. Both deposit and bonus amount must be wagered 10 times if you are using them for Sportsbook. Both deposit and bonus amount must be played 40 times for Casino games. The validity period of bonus is 30 days. In other words, you have 30 days to fulfill the wagering requirements. On the contrary, if you don’t succeed, all the bonus money will expire. The registration procedure is very simple. Make sure to follow our step by step guide, and you’ll have your account in a few minutes. Visit the 234Bet website and click on ‘Register’ button. Fill in the registration form with required information. Check the box that says that you are declaring to be over 18 years and you know and you accept the Terms and Conditions of the oprator. Make sure to read the list of T&Cs before you accept them. 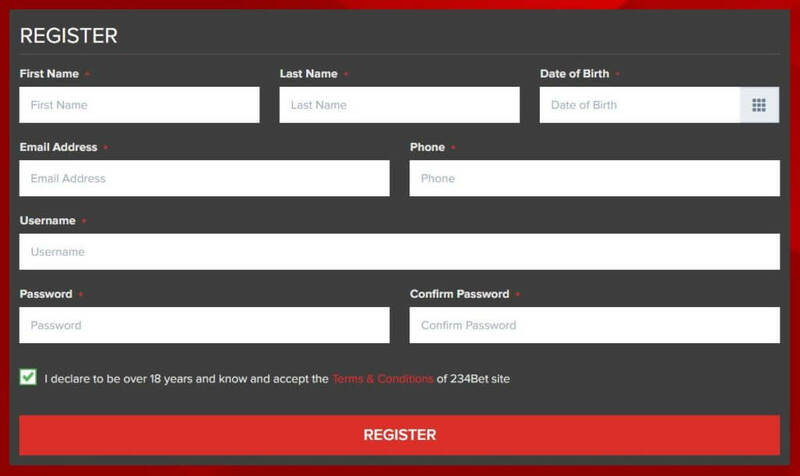 Click the ‘Register’ button in order to complete the registration procedure. 234Bet is a new, innovative and trustworthy online sportsbook in Nigeria. The interactive online sports betting platform takes the betting adventure to a whole new level. The website is very user-friendly, and it features plenty of different sports events and betting options that you can bet on along with competitive odds. You can bet on different sports including Soccer, Tennis, Basketball, Volleyball, Baseball, Ice Hockey, American Football, Bandy, Boxing, Darts, Handball, Rugby, Snooker, eSports, Floorball. The 234Bet also provides services of 24/7 live betting on various betting markets. The only difficulty you might have while using the 234Bet is not to know what to choose. There’s also an innovative Cash-Out feature. Along with the in-play betting, the Cash-Out feature gives you more control over your own bets. The in-play betting allows you to place bets after events have started, so you can react to what’s going on as you watch the live event. On the other hand, the Cash-Out option gives you a possibility to cash out your bet before an event has finished. The good news is that there is no fee when depositing and withdrawing money. The minimum deposit amount is NGN 100, while the maximum deposit amount is NGN 1.000.000. You can also use your international card for transfers. You can bet safely and securely with easy-to-use 234Bet mobile and desktop website, as well as through the mobile application available both on Apple and Android devices. With plenty of betting markets, the possibility of 24/7 in-betting and cash-out, the 234Bet leaves punters spoiled for choice. Why don’t you check out the website and see for yourself? If you decide to register, don’t forget to redeem the 234Bet welcome bonus.